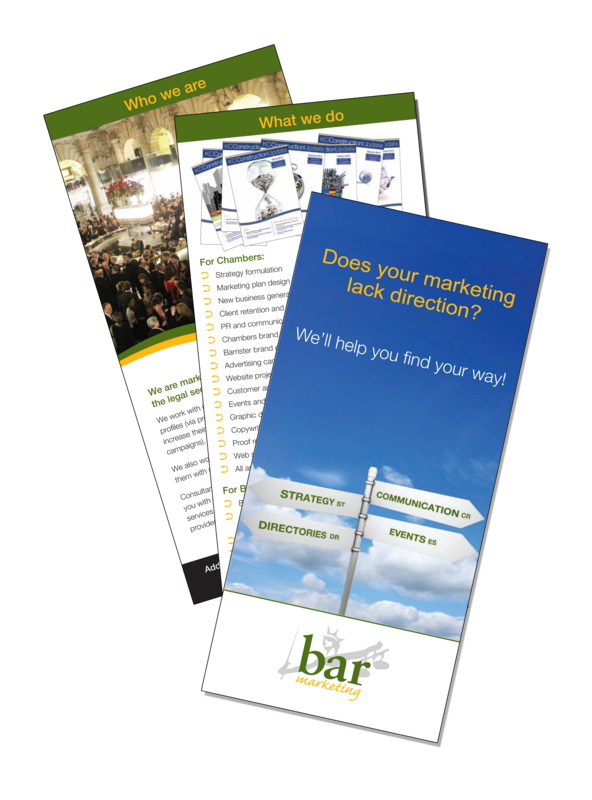 Since our establishment in 2011, Bar Marketing has been the leading barrister marketing consultancy supplying marketing 'on-demand' for the Bar. We work with sets of all sizes from small regional sets to magic-circle sets. Our thorough knowledge of the Bar and its idiosyncrasies enables us provide the marketing services chambers and individual members need on a basis to suit their needs. Our marketing 'on-demand' services include; marketing planning, strategy, event and business development; directory submissions, communications, awards submissions, graphic design to name but a few. We are conscious that your chambers needs to keep overheads to a minimum in order to retain your competitive advantage over law firms and ABSs. We understand that chambers need to add to their marketing skillsets without necessarily adding to their headcounts. After all why would you pay someone for the quieter summer months if you don’t have to? Therefore, we offer our marketing 'on-demand', that way you only pay for what you use. First-class advice and practical recommendations on many marketing aspects from strategy to direct marketing and e-marketing; positioning to multi-channel campaign management. •	Access to expertise without adding to headcount. •	Unbiased evaluation of current position. •	Recommendations for improvement and best-practice. •	Fresh ideas for delivering projects and strategies. In essence this is the equivalent of having an extensive marketing resource in-house without the employment costs and other issues. For use on all marketing or project-by-project. •	The responsibility for your marketing operations rests with us. •	From brand awareness and lead generation to client retention strategy, we do as much or as little as you want us to in line with your business needs. •	It allows your clerks to focus on their high-value tasks whilst we get on with the business of marketing. •	Immediate access to marketing skills and resources proven in the UK legal market. •	Particularly attractive to chambers that are experiencing rapid growth, or for those who have limited line marketing management needs, yet require input to various marketing projects. Marketing 'on-demand', consultancy or outsourced, we focus our efforts on providing you with better marketing than you currently have. We just do it in a way that suits your way of working and that will provide you with the best return on your investment. By using Bar Marketing you can add to your marketing skills without adding to your headcount. With a degree in Marketing and over twenty five years' of experience in strategic and operational marketing, including more than a dozen in the UK legal sector, Catherine fully understands the needs of chambers and can ensure that they receive just the right mix of marketing required to secure new business and leverage from existing clients. Previously Head of Marketing for Advanced Legal (Meridian, AIM, AlphaLaw, Opsis, Videss, Mountain, Laserform and GB systems) Catherine has the depth of knowledge of the Bar and law firms that truly sets her and Bar Marketing apart from other marketing consultancies. Jennet's worked in the marketing field for 17 years, 13 of which have been within the legal sector for software suppliers, outsourced service providers, law firms and barristers' chambers. She holds Chartered Marketeer status, an accreditation maintained through the Chartered Institute of Marketing's ongoing CPD programme. Jennet particularly excels at copywriting although her skill-set is broad and she can put her hand to anything from advertising to websites. In fact, Jennet enjoys a varied workload and likes to get her teeth into challenging projects! An experienced financial and data analyst with over 25 years of financial services experience, Pete is responsible for all aspects of client data, including quality control and data set building. His years of experience means that he is the ideal person to conduct any analysis of prospective data to ensure suitability for purpose, complete with client recommendations. He is also a skilled social media marketer and renowned proof reader, particularly with regard to legal-specific text. His communications marketing includes website content, social media marketing and collateral production. Patricia is the 'go-to' person for cutting edge design. She has worked with many organisations covering the whole spectrum of sizes and industries, from start-ups to IPOs and major blue-chip companies producing brand identities, logos, collateral, advertisements and graphic design. She has an unrivalled eye for design detail and excels in creativity. Patricia's many years of experience within the UK legal sector enables her to perfectly match the graphic design she is creating to the brand with which she is working and the aims of the firm or chambers. She consistently delivers high-quality graphic design to the given timescales and within budget. Andrea is a fully qualified chartered accountant and is responsible for our accounting and accounts production.